Today was Brian's "last day of school" party and there was no one that was happier than me to be there! It was one event that I swore I would not miss - whether Gavin was still in the hospital or not. I couldn't disappoint Brian on this very special day!! Tomorrow is his last day before a three week break. He'll go back on August 23rd to the same classroom with the same teachers...and many of the same classmates!! This classroom and his teachers, Miss Laura and Miss Morgan, have been so good for him. He's blossomed in so many ways! We were told to send him to school in his bathing suit - they set up sprinklers and a water table and a kiddie pool as part of the party! Brian ended up not swimming. He was attached to my hip (which is how he's been since I got home) and holding my hand the entire time. He didn't let me out of his sight. The class had been working hard for weeks to put on a show for all of us. We all filed into the auditorium and I was, of course, in the front row with my camera in one hand and my phone in the other - stressing about the poor lighting conditions. I was on the edge of my seat when Miss Laura announced each of the performers. Brian made such a dramatic entrance (click below to see). I had high hopes for this stage performance! Brian spent much of the performance hiding behind his claps. I started to panic. If I'm to keep his sweet face far away from any contact sports - I really need to work on his stage presence. I see theater boot camp in our future. In all seriousness, it was hard not to cry as I watched Brian on stage. Simply because I can't believe I'm watching my own child do something so independent. That he's old enough to walk - let alone stand on a stage and (kind of) remember choreography and songs! After the show, we went back to the classroom for special cupcakes that the kids help to make! If you remember when Brian first started in this classroom, a little girl named MacKenzie befriended him. As you can see, they still have a "thing". 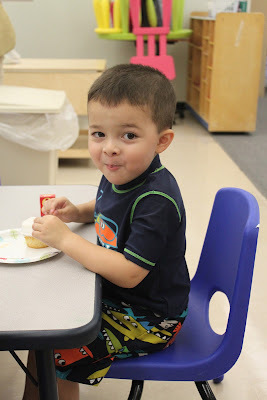 It was so fun to spend the morning with Brian at school. For both of us!! This afternoon was a little sad. 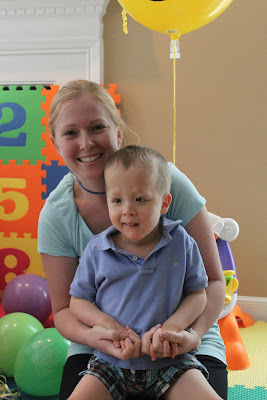 It was Gavin's very last Occupational Therapy session with Miss Stephanie!! She has been such a big part of Gavin's life (and progress!) for the last two years. And she's become a friend, that's for sure. This wasn't the way I intended the last week of therapy to be - so I'm planning a party for all of Gavin's therapists so we can have a proper goodbye - and thank them. Gavin's come such a long way since Stephanie started. He really connected with her which I think is half the reason why he did so well! The other half (which is way more than half, really) is her exceptional OT skills. I loved her ideas for Gavin - her approach - the creative activities she came up with. Gavin started doing things with her that I wasn't sure I'd see for a long time. Like picking up little objects and placing them in containers!! And - the biggest accomplishment of all - feeding himself. 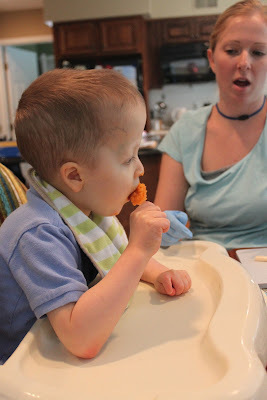 I am so grateful to Miss Stephanie for pushing Gavin (and me) to start feeding himself. We love you, Miss Stephanie! And we'll miss you so much. Gavin is doing well at home. He has been extremely exhausted (as have I!) and has wanted to be held a lot. It's been a bit of an adjustment for me - especially last night - to not have my eyes on him all the time. But he's great - really. Just very, very tired. We both are. It was a very long week.